Special Aluminum Connectors | Special Copper Connectors | Cal Fasteners, Inc.
CMC manufactures a wide range of special connectors in both aluminum and copper. They are designed for unique applications where standard mechanical connectors do not match the configuration, size, or capacity requirements. If none of our other CMC connectors are right for your application, there is likely a special version available that will meet your needs. Aluminum and copper special connectors are available. CMC’s special copper connectors were designed specifically for applications where maximum conductivity is a must. They are manufactured from 100% electrolytic copper tube or extrusion. 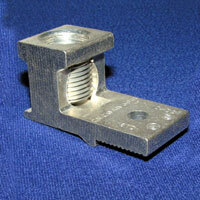 Request a quote on special aluminum or copper connectors for your application, or contact Cal Fasteners to learn more.